Hrbxdw.com - Fears for your feline: is mad cow disease tainting mainstream pet foods? Fears for your feline: is mad cow disease tainting mainstream pet foods? On December 23, 2003, the first case of bovine spongiform encephalopa disease--was confirmed in the United States. BSE is a prion (a protein-like infectious particle) disease that basically eats holes in the brain tissue of humans and animals who've ingested parts of an animal that was already suffering from a prion disease. Examples include BSE in cows, chronic wasting disease (CWD) in mule deer and elk, and scrapie in sheep. There is no cure. BSE devastated parts of the European agriculture industry in the 1990s. The US government was quick to assure consumers that the beef they were eating was safe--but it was later found that some of the BSE meat had been shipped to wholesalers and retailers in six western states. Dow Jones Newswire reported that from "slaughter to supermarkets and restaurants, about 580 businesses handled the meat." At the same time, concern arose as to the disposition of other parts of this particular cow, parts deemed "unfit for human consumption." According to then-Agriculture Secretary Ann Veneman, "The animal's brain and nervous system tissue--material considered at high risk for conveying BSE--did not enter the human food chain. That material was sent to a rendering plant to be made into pet food or for other uses." For those of you who are not aware, a rendering plant is a large facility that processes materials from slaughterhouses, road kill, zoo animals, restaurant and grocery store garbage and even euthanized companion animals. These materials are mixed together, then cooked at 245-280F. Next, the fat is drained, and the remainder becomes the meat meal and the meat and bone meal found in many mainstream commercial pet foods. The question thus becomes: Is BSE infecting our pets? In 1990, the first case of feline spongiform encephalopathy (FSE) was confirmed in the United Kingdom. This prion disease is often seen in middle-aged to older cats and is believed to take many years to develop before clinical signs can be observed. Felines appear wobbly and uncoordinated when they walk. Friendly cats may become aggressive or nervous and may hide from their owners. Since 1990, more than 100 cases of FSE have been identified in Britain. Veterinarians suspect, however, that hundreds if not thousands more cases have either been misdiagnosed or--because cats tend to wander off to die--have not come to light. FSE cases have also been reported in Ireland, Norway, Liechtenstein and Switzerland. The consensus among experts is that the cats had acquired the disease from eating commercial pet foods containing BSE-infected animals. FSE has also been reported in pumas, cheetahs, lions and tigers living in zoos and eating infected meat. In June of 1989, the UK's Pet Food Manufacturers Association (PFMA) decided to adopt a voluntary ban on specified bovine offal (SBOs), substances composed of the brain, spinal cord, tonsils, spleen, thymus and intestines of a cow. And in 1996, the Ministry of Agriculture, Fisheries and Food (MAFF) also banned the use of the heads and tongues of cattle in pet foods. The number of infected cats began to drop after this ban became effective. 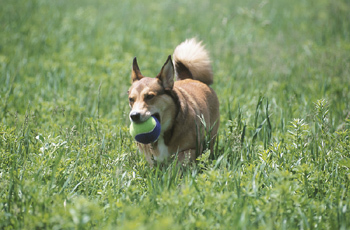 To date, there have been no confirmed cases of canine spongiform encephalopathy (CSE) in dogs, although controversy arose after a report in the early 1990s came to light. The report from the BSE Inquiry Advisory Committee--impaneled in London by the British government--referred to a study of 444 hounds from more than 100 kennels who were examined pathologically to ascertain whether the same brain lesions found in infected cats also existed in dogs. Material similar to scrapie in sheep was observed in 19 cases of hounds 7 years of age. No further studies were undertaken. The committee went on to state, "By inference, this could also mean that tire disorder is clinically silent and nonprogressive in dogs." It should be noted that the vast majority of these cases were not open to accurate scientific interpretation because tissues had been inadvertently mishandled. The pet food industry in the United States is basically unregulated in terms of allowable ingredients. The only rules that companies must follow apply to labeling. That is, a product must show the name of the maker, the weight, the ingredients and whether it is intended for dogs or cats. Nothing more is required. In 1997, the US Food and Drug Administration (FDA) banned the feeding of ruminant animals to other ruminant animals because of the fear of spreading BSE. This material, however, was still allowed to be fed to pigs, chickens and pets, even though it was known at the time that cats could contract the feline form of this disease. A spokesperson for the Pet Food Institute stated that the risk of cats contracting this disease in the United States was "infinitesimal." But can they be sure? After all, it only takes one teaspoon of this material to infect a cow. How much less, do you suppose, would be required to infect a smaller sized companion animal? The position of Stephen Sundlof, DVM, director of the Center for Veterinary Medicine at the FDA, was that "animals declared unfit for humans can be used in pet food." Sundlof went on to say, "But they must be processed in such a way that they are deemed safe for the pets. This generally means that the pet food must be heat-treated or the animal-derived parts must be rendered to destroy any possible pathogens." Sundlof should be aware, however, that nothing known--including cooking, freezing, ionizing, radiation, autoclaving, sterilization, bleaching or treating with formaldehyde--can destroy the prion that causes BSE. In interviewing veterinarians, I have asked whether many pet owners ever have autopsies performed on their cats and dogs that display symptoms typical of an animal infected with a prion disease. The answer from 99 percent of the veterinarians was no. Richard Pitcairn, DVM, wrote, "Very, very few owners would request a complete autopsy on a pet that had died from neurological disease. To do this properly, the skull must be opened, and I never encountered a practitioner prepared to do this." That may mean prion diseases are going undetected. The government seems to have taken the position that because we as humans don't eat dogs and cats, then the diet they are being fed is of little consequence. After the ball on feeding ruminants to ruminants in 1997, the FDA suggested that warnings be put on commercial pet foods tinder the assumption that pet foods might accidentally be fed to cattle. The pet food industry frowned on this suggestion based on the belief that consumers would question the safety of the products they were feeding their pets. No further action was taken until the BSE case in December 2003 forced the FDA to act. On July 9, 2004, the FDA announced proposed rules that would ban all specified risk material (SRM), which includes "the brain, skull, eyes, and spinal cord of cattle 30 months of age and older, plus the small intestine and tonsils from cattle of all ages." The specified risk material would be removed front "all animal feed, including pet food." Various trade groups, including the National Renderers Association and the American Meat Institute, voiced opposition on economic grounds. If this proposed rule is passed, we could be somewhat assured that our pets wouldn't be eating BSE-infected meat. However, at this point, it is doubtful that the FDA will see fit to ban SRM from pet foods, chicken feed and hog feed because of pressure from trade groups and farmers' organizations. A decision will likely not come until at least 2007. In the meantime, consumers do have a few choices. First, write to your senators and members of Congress, and demand that all SRM be removed from commercial pet foods. Second, be sure to avoid feeding your pet mainstream foods that contain meat meal, meat and bone meal, beef in any form, fats and tallow. Third, feed your pet only natural pet foods that contain purely human-grade ingredients. In past columns, I have suggested a few I have personally researched. Or, you could cook for your pets, as I've done for the past 15 years. Whatever you decide, the peace of mind you gain from knowing your beloved animal is safe from insidious diseases such as BSE is well worth it. Copyright 2010 PRIMEDIA Intertec, a PRIMEDIA Company. All Rights Reserved.